This is Calyx. Air, light, space, function, beauty - in sync with nature. Inspired by the outer whorl of green leaves that cradle the flower, Calyx answers the need for residential options that support the environment. Like the perfect spiral chambers of the nautilus, many of the design elements of the condominium are driven by a strong purpose to define a secure and balanced lifestyle for its residents. 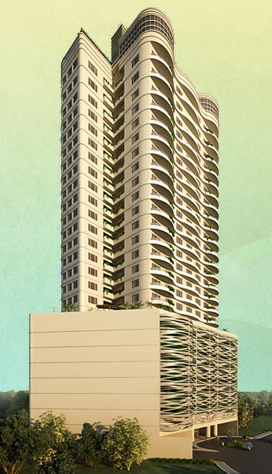 Calyx Residences is a concept that honors the Cebuano sense of value and quality at the right price. Calyx Residences is a green residential condominium developed by Innoland, the developer behind Calyx Centre at Asiatown I.T. Park. Sporting the same iconic and organic architectural aesthetics, Calyx Residences boasts of the same eco-friendly design philosophy that made a favorable impression on the market. Driven by a strong purpose to integrate natural elements in its design, Calyx Residences offers sustainable green lifestyle as an easy option to urban dwellers: Natural ventilation and lighting through air and light wells in hallways, green zones with plants to clean the air, gardens and reflecting pools around the building to cool off surrounding areas, use of compact flourescent lighting and inverter type air-conditioners to reduce energy consumption, low flowr water faucets and dual flush water closets to conserve water, a radical new layout that locates the kitchen and work area next to operable windows for natural lighting and ventilation - the list goes on. Modern amenities are not compromised and are planned to enhance the condominium lifestyle. Safety and security are assured with electronic pass card for elevators, 24-hour security, water sprinkler and fire alarm system. Standard features include cable ready outlets, telephone jacks, 60x60 porcelain floor tiles, granite kitchen counter top, stainless steel sink with grease trap, American Standard bathroom fixtures, kitchen cabinetry, wardrobe closets, even additional storage for a washing machine or pantry. To top it all, power blackouts will be addressed by 100% generator back-up. The mainstay of the condominium is the 26 sq.m. studio unit which may be merged with another studio unit. Priced at P2.5M each, the units are VAT free. Special merged untis on the 4 corners of the building provide bigger space options. Garden Lanai Suites and Penthouse units give buyers more luxurious choices. Adhering to its vision of being a revolutionary developer dedicated to a green design philosophy while offering what matters most at a price hard to resist, the developer captures the Cebuano quintessential sense of values. Contact us now and find out how you can easily own a one-of-a-kind home that truly enhances your condominium lifestyle. To enhance your buying experience, it is our job as real estate professionals to provide you with as much valuable information as possible. It is essential that the buyer be aware of all aspects of Calyx Residences project before making a major decision. Whether it be through newsletters, checklist or news articles, we are here to make this process stress-free and rewarding. Please access our free reports today!